Nerf Nation, the time is nigh. The new generation of Nerf weaponry is here! OK, we can skip the dramatics but I really do have some fun news. And whether you partake of Nerf battles yourself, or there are children or grandchildren in your life who do, take note. 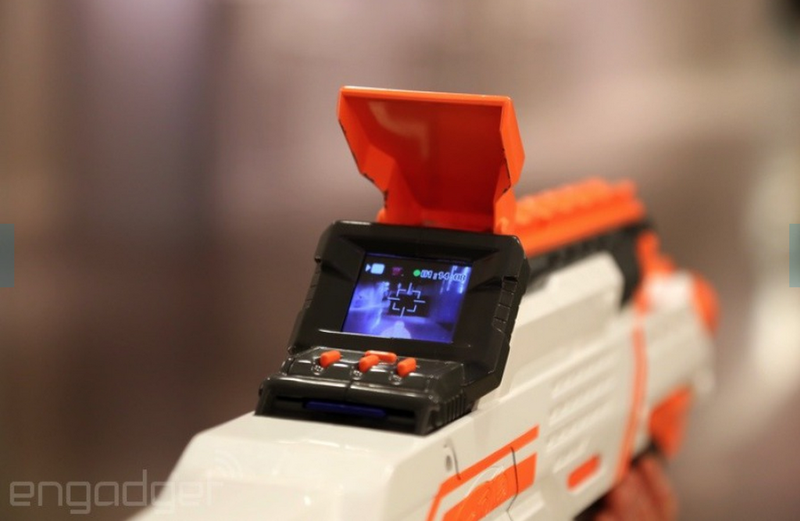 There is a new Nerf gun rifle in town that has a built in video recorder, camera and built for extreme fun. It even has a built in SIM card that stores up to 4 hours of video you can pop into your computer and post your great battle moments to social media. That's right, you can actually record your Nerf missions and share them on Facebook, Twitter, Instagram, etc. (you get the idea). Hasbro's "Head of Nerf" Michael Ritchie explains, "The Nerf fan base is technologically savvy and socially active so making products that fit their lifestyle is key." So how much will this bad boy of safe shooting run you? If you're in the market, expect to pay $79.99 for the new model. It's a small price to pay, in my opinion, for this kind of fun - especially with the added value of harmless social media shaming. Next page: Oh, you want to see it in action?